Take a small group adventure in Argentina where the tango-filled streets of Buenos Aires create an atmosphere like nowhere else. Try local dishes and trek in Patagonia's Torres Del Paine National Park. With the astonishing people, music and nature, it will be hard to leave. Being in the Southern Hemisphere, Argentina's seasons are the complete opposite of the UK. Their summer season, from December to February, is the most popular time to visit Patagonia, which at other times of year can be bleak and inhospitable. The shoulder months of March-April and October-November are also good times to explore the southern part of the country, as fewer tourists visit the region at this time, but the weather is still largely sunny and warm. As for the rest of the country, the northern reaches around Salta and Iguazu are hot during summer but still temperate during the winter months of June to August. Buenos Aires is the same, with largely mild winters and hot, sunny summers. Argentina can be considered a year-round destination, with only the Patagonian wilds really inadvisable between May and September. The Valdes Peninsula is famous for the Southern Right whale migration that takes place between June and December, while orcas may be seen from September-November and in May-June. Spotting whales here is largely a matter of timing, but if you visit outside of these months there is plenty of other wildlife to see. Large colonies of sea lions and elephant seals are resident on the shores for much of the year. Bottlenose and Commerson's dolphins are also sighted playing in the waters, while on land, rhea, guanaco armadillos and gray foxes inhabit the peninsula. On Explore's most popular holiday to Patagonia, you will have the option to visit the Isla Martillo, off Ushuaia, where a colony of resident Magellanic penguins play in their natural habitat. A local guide is essential here, as you'll be walking around the colony trails among the penguins themselves. Alternatively, the colony at Punta Tombo is another important location from which to spot these beautiful and quirky creatures. The wonderful thing about Patagonia is that it's just so easy to spot mammals as you're hiking in any of the national parks. Guanaco, grey fox, mara (Patagonian hare) and wild horses are just some of the larger mammals that you might come across or see from afar. 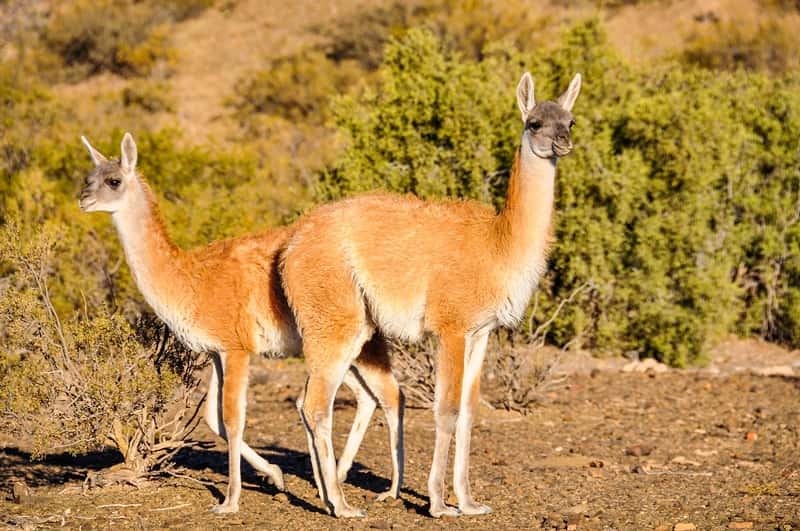 Particularly in Tierra del fuego, the guanaco are numerous and far from their predators on the mainland, the Patagonian puma (mainly found, but rarely sighted, in the neighbouring national park of Torres del Paine, Chile). Iguazu is most famous for the Great Dusky swift, which nest on the rocks behind the falls and which can be seen in their thousands, flying through the mist of the cascading waters. Surrounding the falls is the Atlantic rainforest, a paradise for bird spotters who will delight in the variety of species of toucan, woodpecker and hummingbird to be found, as well as flycatcher, tanager and many others. If you decide to extend your Argentina trip with a visit to Iguazu, it's worthwhile coming away from the falls for half a day, to explore the vast national park, and the over 400 different species of bird that have been recorded here. It's frankly impossible to take a trip to Argentina without getting into the impressive food scene. There is a lot here for vegetarians to enjoy, but most of the joy of what we may consider 'traditional' Argentinian cooking comes from the country's famous beef - succulent and simply cooked, it's a standout part of any holiday in Argentina. Everywhere you go in the country, you'll be able to find a good 'parrilla' (traditional barbecue) which generally serve up almost every part of the cow at your discretion, from the different cuts of steak to intestines and even brains. Don't worry if you're feeling faint-hearted - just choose a juicy rib eye with a simple leafy salad and you can't go wrong. Up in the north west of Argentina, the famous snacks of 'empanadas' are delicious, moreish mouthfuls of pastry, stuffed with a variety of meat, corn, cheese or chicken and baked to perfection. This is more of an Andean delicacy, and you can find empanadas cooked in a variety of ways throughout most of the Andean countries up to Colombia. What most visitors to Argentina will definitely have on their radar is the range of wines cultivated in the local vineyards. Mendoza in particular is a wine-making hub and producer of the famous malbec. On Explore's Northwest Wines and Landscapes tour, you can taste the wines in multiple vineyards, around two different wine-making regions of Argentina.